Quincey Bernard (center) working with his team at the Innovation Challenge, an entrepreneurial event hosted at the College of Business. The Center for Entrepreneurship at the University of Nebraska–Lincoln looks to connect with local entrepreneurs to participate in Lincoln Startup Weekend, January 25-27. Hosted at Fuse Coworking, the center teamed up with the Lincoln Partnership for Economic Development and the university’s Engler Agribusiness Entrepreneurship Program to coordinate the event. Open to the public, the registration fee is $20, with a deadline of January 23. To register, visit: https://go.unl.edu/startupweekend. The event, powered by Google for Startups and Techstars, gives participants 54 hours to pitch an idea and work in teams to create a prototype of their idea, all within the span of a weekend. With the ability to test their ideas, participants learn new skills and work closely with those pursuing the path of an entrepreneur. “Lincoln Startup Weekend provides an opportunity for students and community members to start working through ideas they have considered pursuing. It allows them to work with like-minded individuals, expand their network and enhance their knowledge of entrepreneurship,” said Dr. Sam Nelson, director of the center and assistant professor of practice in management. The ideas will come to life throughout the weekend as participants spend time testing, developing business models and performing basic prototype creation. Local professionals will be onsite for support as coaches to advise and assist teams. During a luncheon held the second day of the event, Paul Jarrett, co-founder and CEO of Bulu Box, will speak on his experience running a startup. Students will collaborate with members of the community to create a mock startup during the event. 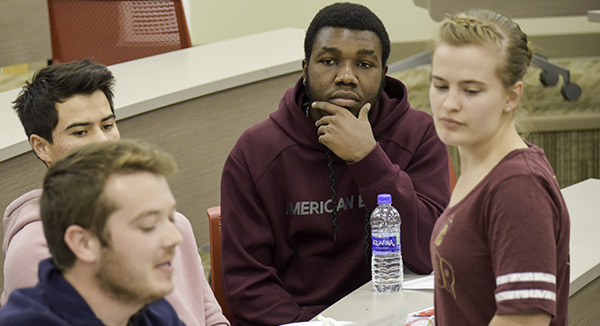 Having competed in past competitions put on by the Center for Entrepreneurship, Quincey Bernard, a junior international business major from Port-au-Prince, Haiti, plans to attend and expects to learn more about how cohesive teams at startups take their visions and turn them into reality. “One thing I’ve been good at was having a great plan and having the strategy done. I was never able to build a really well-made minimum viable product. I look forward to succeeding in a balanced team dynamic offered at Lincoln Startup Weekend. I can bring strategy and team up with people who have other skillsets – like someone with technical skills or someone who knows how to reach an audience,” said Bernard. The Center for Entrepreneurship coordinates many events similar to Lincoln Startup Weekend, such as the upcoming New Venture Competition where students compete for over $75,000 in total prize money. Nelson encourages participants to take advantage of the multiple opportunities to pitch their ideas, provide feedback on other ideas and network. “The event is a great opportunity for us here at the center and those at the Lincoln Partnership for Economic Development and Engler Agribusiness Entrepreneurship Program, to share resources and increase the overall participation by tapping into each of our networks. The whole weekend highlights the collaborative nature of our community and our university,” Nelson said.